Non profits are often misunderstood. Many think of non profits as “charities” and are only for making tax deductible contributions. Some are and operate only on those donated funds but most are simply entities (organizations, companies, etc.) which are granted tax exempt status by the Internal Revenue Service. Some of these entities also qualify for tax deductible contributions. Non profits are just like most businesses with employees, a revenue stream, management expenses and more. They are usually managed by a board of directors along with normal management staff. Keeping the doors open is a challenge. We have a few ideas with regard to our experience with non profit fundraising. Sell decorated wearables like shirts, jackets and caps at events where lots of people attend. Select items with large imprint areas (tote bags, plastic bags, clear stadium bags) so sponsors can share the imprint area. Two for one marketing. Some items allow for a two side imprint. Your non profit on one side and the sponsor on the other. Look at all of the costs before discounting something as being too expensive. There may be a discount for your non profit if you order a certain quantity. Sales aren’t always published and your sales rep can help! 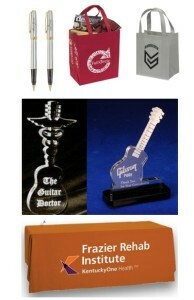 Use custom shaped acrylic pieces as awards for activities and thank you gifts. Use higher end crystal and art awards for special honorees. Be sure everyone takes something away with them. This item will help them remember your organization, the message and/or the good time. Our clients have used poker chips, shot glasses (non drinkers use for toothpick holders) and molded chocolate. Decorate for your event with custom cups, napkins and coasters. Coasters are a great medium for making announcements. You can get glassware with your imprint. Give personalized, high end laser engraved pens as thank you gifts. Be sure to recognize volunteers. Imprinted table covers for activities and exhibits. Printing and marketing materials which include business cards, note pads, scratch pads and more. Don’t view your promotional products sales rep as a way to get a lower price. Look to them for a way to get ideas and the best value. The lowest price isn’t always the best value.